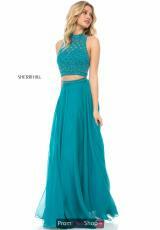 Charismatic and enchanting, this remarkable Sherri Hill prom dress 51724 will dazzle all guest. This enthralling two piece style is the perfect choice for your senior prom, showcasing a halter beaded crop top and chiffon a line skirt. Lustrous stones adorn the bodice beautifully, creating an opulent embellishment that is simply breathtaking. Flattering on all figures, the beaded waistline defines your figure as the chiffon a line skirt flows with elegance and grace.